☸Sterling Silver Compass Bracelet inspired by a compass rose, sometimes called a wind-rose. Everybody has the confused time then you need someone to guide you and lead you just like the compass. Sterling silver compass direction engravings charm display the orientation of the cardinal directions, symbolize the compass rose tells us directions and keep us from getting lost. 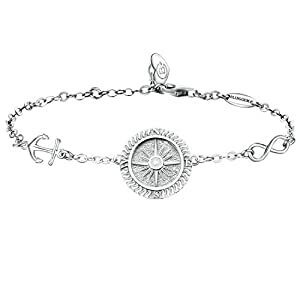 ☸BlingGem Exquisite Compass Rose Bracelet made with white gold-plated 925 sterling silver, decorated with 2 lovely hearts, extension design (17cm+2.5cm extension) to fit different wrist sizes. Lead-free and nickel-free. ☸Come with BlingGem black elegant jewelry box. Great for Birthday gift, Graduation gift, Retirement jewelry gift, Christmas gift, Anniversary gift, Mother’s Day, Valentine’s Day gift, Thanksgiving Day, Romantic Surprises. 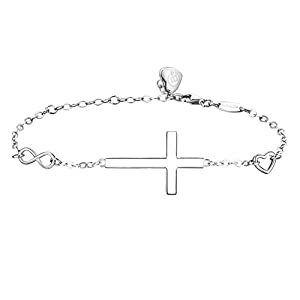 ✞ The constant classic cross-shaped bracelet, decorated with an infinity sign and lovely heart. Represented in its simplest form by a crossing of two lines at right angles, it’s the principal symbol of the Christian religion and also used for its ornamental value as the symbol of sacred fire or as a symbol of the sun. ✞ Come with BlingGem black elegant jewelry box. Great for Birthday gift, Graduation gift, Retirement jewelry, Christmas gift, Anniversary gift, Mother’s Day, Valentine’s Day gift, Thanksgiving Day, Romantic Surprises. CHAKRA/GEMSTONES: Root Chakra/Red Jasper, Sacral Chakra/Carnelian, Solar Plexus Chakra/Tiger Eye, Heart Chakra/Green Aventurine, Throat Chakra/Aquamarine, Third Eye Chakra/Lapis, and Crown Chakra/Amethyst. Balance of bracelet contains Rudraksha beads to help in meditation, healing, and the protection of energy. Rudraksha beads also absorb oils readily making this an excellent essential oil diffuser bracelet. Note: Some essential oils can break down elastic string. 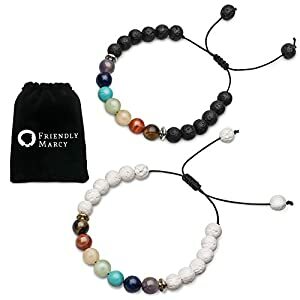 GENUINE & UNIQUE: All gemstones used on this bracelet are genuine (not man-made or synthetic like many others being sold). 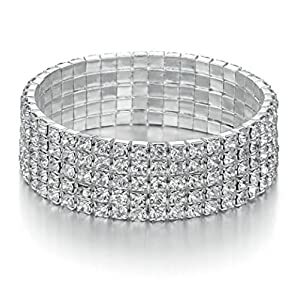 We have hand selected each of the stones in your bracelet. 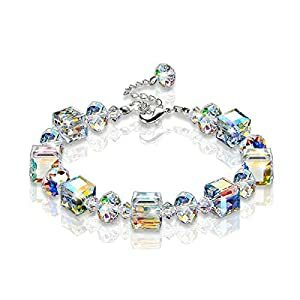 All gemstones are unique, therefore the color and pattern may vary from the picture shown but we know you will be pleased with the high quality and uniqueness of your bracelet. DURABLE: Made with the finest quality stretch bracelet string, doubled for extra security. Knot hidden inside beads for clean appearance. 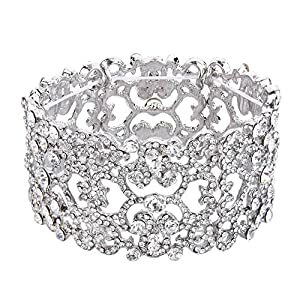 Vintage inspired art deco stretch full clear crystal bracelet, wearing this kind of jewelry will make you more eye-catching. 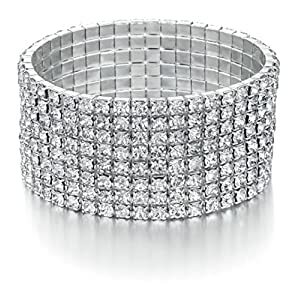 Stretch Bracelet Length: 17cm(6.7″), Width: 3.3cm(1.3″), Weight: 55g. Length: 17cm(6.7″), Width: 3cm(1.2″), Weight: 59g. 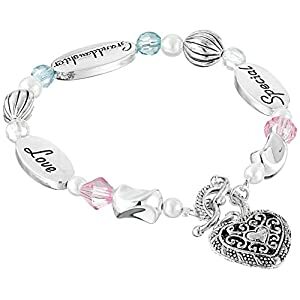 Clasp bracelet encircles the wrist with pastel faux gemstones, silvery beads, and dangling heart charm. Comes with presentation box and heartfelt message card enclosed. Message varies between Daughter, Grand-Daughter, and Mother. SOLAR SYSTEM & 7 CHAKRAS – The solar system bracelet inspired by the solar system, include nine planets and guardian star. You are the sun, all the planets are around you turn up. 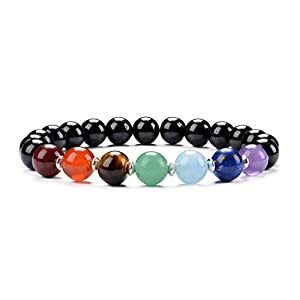 The 7 chakras bracelet represent spiritual power in the human body, made of lava rock, drop the essential oil on the volcanic stone beads and the scent can remain for a long time. 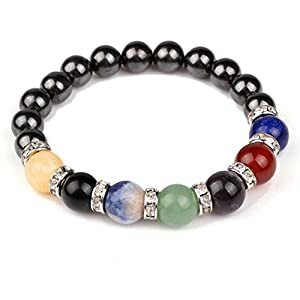 SIZE – Solar system bracelet inner length is 6.8″ and they are adjustable; The 7 chakras bracelet inner length is 6.5″ and they are adjustable. All of them fit most of the size. 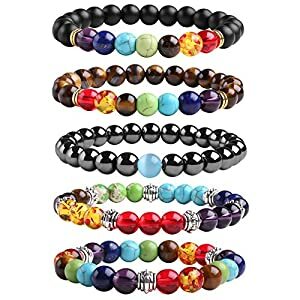 MATERIAL – Handmand yoga bead bracelets are made of natural lava rock stones with various colors of gemstones, the lava rock bracelet set can absorb and hold essential oils, helps you cultivate your body and mind. 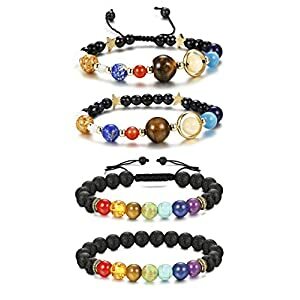 ❤-Set of 5 Chakras Bracelet: Root Chakra, Sacral Chakra, Solar Chakra, Heart Chakra, Throat Chakra, Third Eye Chakra, Crown Chakr. 5 different bracelets can easily go with any outfits On different days. 7 Chakras are known to bring emotional peace and bring the mind, body, and spirit into harmony. ❤-FEATURE Beads Size: 8mm; about 7 inches inner circumference, fits wrists from 6 to 9 inches. Each bracelet is handmade with love, care and positive energy. 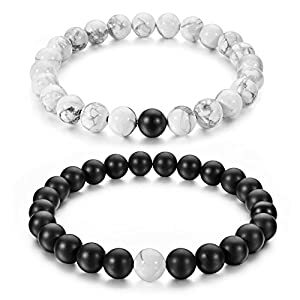 ♬- SPECIFICATION: Each beads 8MM; 2 DIFFERENT SIZE TO MATCH: 7 inches white howlite bracelet match with 8 inches matte black onyx bracelet or 8 inches white howlite bracelet match with 7 inches matte black onyx, both small wrist and large wrist could be fit perfectly. Our durable elastic cord is covered in strong silicone and will permanently keep its soft elasticity. You can comfortably wear these bracelets every day and don’t worry about them breaking. ♬- HEALING GEMSTONE: Natural White Howlite and Ntural Matte Black Onyx are extremely calming stone. White Howlite can bring the wearer a sense of patience and help get rid of anger and rage. Because of this sense of calm the stone brings about, it is used as a sleep aid. Matte Black Onyx helps to inspire objective thinking and spirituality while helping one be in control of emotions and passions, especially helps eliminate negative thinking and stress. 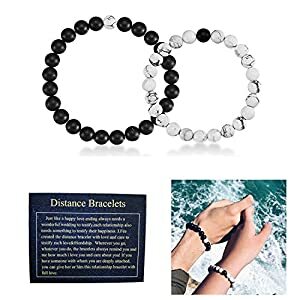 ♬- A THOUGHTFUL GIFT: Have this pair of bracelets, feeling together no matter where you are & no matter how far with your lovers, Mom, dad, daughter, sister, and best friend. Distance and time apart from someone can be hard, but so sweet when knowing you are missing each other at all times. Comes in a pretty sapphire gift pouch, you will receive a pair of relationship bracelets. Natural wishing healing stones. The Black Matte Aagte shows his masculine and energy, could help to release stress. The White Howlite shows her pure and beauty, help her to be healthy and lucky. 8mm same size round beads, White: 19cm,Black:20cm in circumference, Comfortable wearing, flexible but not loose, durable string could wear each day. 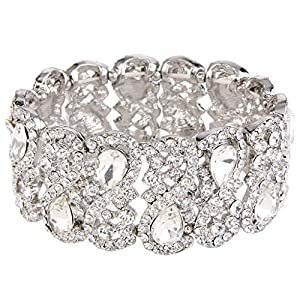 ♥Descriptions♥ This bracelet is strung with sparkling clear crystals, has a beautiful light-catching effect, can be layered with your watch or other styles for an on-trend look.